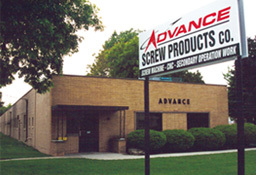 Quality Manufactured Parts / On-Time Delivery / Advance Screw Products Company, Inc.
Over 25,000 Square Feet of manufacturing capacity with room to grow in the future. with each part they manufacture. We feel our attention to Quality, Customer Service and 100% On-Time Delivery is a direct result of why we have grown with our customers. We build all of our own tooling on-site so we can offer the shortest lead-times possible. During the quoting process we work closely with our customers and offer cost saving ideas so parts can be manufactured at the lowest possible cost. To experience true customer satisfaction at a competitive cost send inquires to al@advancescrewprod.com for your prototype low and high volume needs.